A beautiful striking fiery orange coloured tulip, with unique lily-like pointed petals, 'Synaeda Orange' will really make a bold statement in your beds and borders next spring. 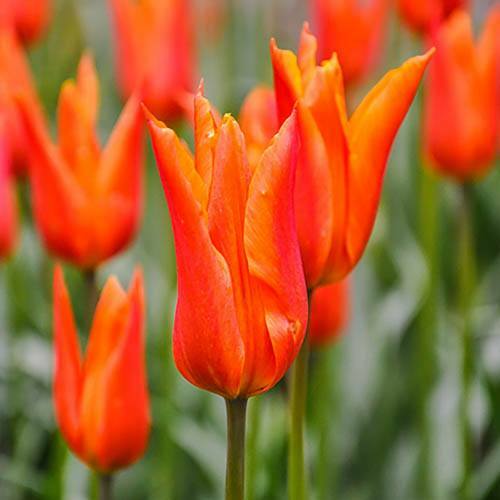 Flowering from April through to the end of May, 'Synaeda Orange' is a vigorous and incredibly versatile variety of tulip that will flourish in a sunny, sheltered spot in the garden or on your patio. 'Synaeda Orange' looks fantastic planted up en masse in a large gap in the border, or why not mix things up and plant alongside varieties such as 'Washington' for an even louder display, or 'Apricot Fox' to tone things down a little. Tulips are one of the most popular bulbs, not only because they look spectacular creating accents of vibrant colour within spring displays but because they're just as great in beds and borders as the are in pots and containers. They're also fantastic as cut flowers that can be brought inside and displayed in vases to brighten up the indoors as well as the outdoors.